February 4 through May 21 By the late 1950s, Stanley Rosen was in the vanguard of American ceramics. 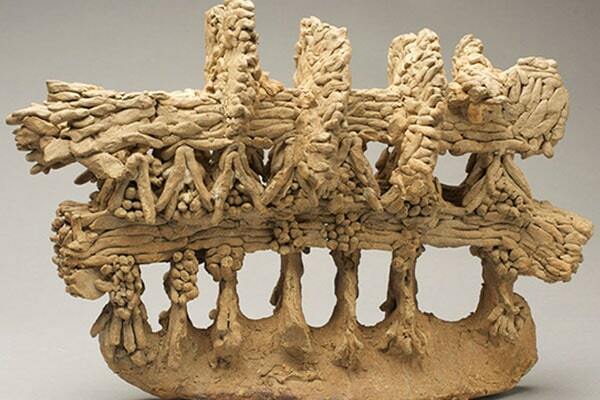 He was one of a small cohort—among them Peter Voulkos, John Mason, and Ken Price—who revolutionized ceramics, making of it a freely inventive and richly expressive art form, liberated from the practical requirements of vessel making and the conventions of the craft tradition. For the last forty-plus years, however, Rosen has focused on his role as teacher (Bennington College, 1960–91) and maker, rarely exhibiting or publishing his work. This exhibition and the accompanying catalogue survey—for the first time—a unique, evocative body of abstract ceramic sculpture representing more than a half-century of artistic creation. Rosen’s sculptures are primal and earthy, sometimes singing, often somber and mysterious. This exhibition and catalogue establish Rosen’s place among the masters of 20th- and 21st-century American ceramics. March 11 at 3:30 pm – Artist’s Reception with Stanley Rosen. Free and open to the public.